This one very well may be the first roadside attractions I ever laid eyes on. 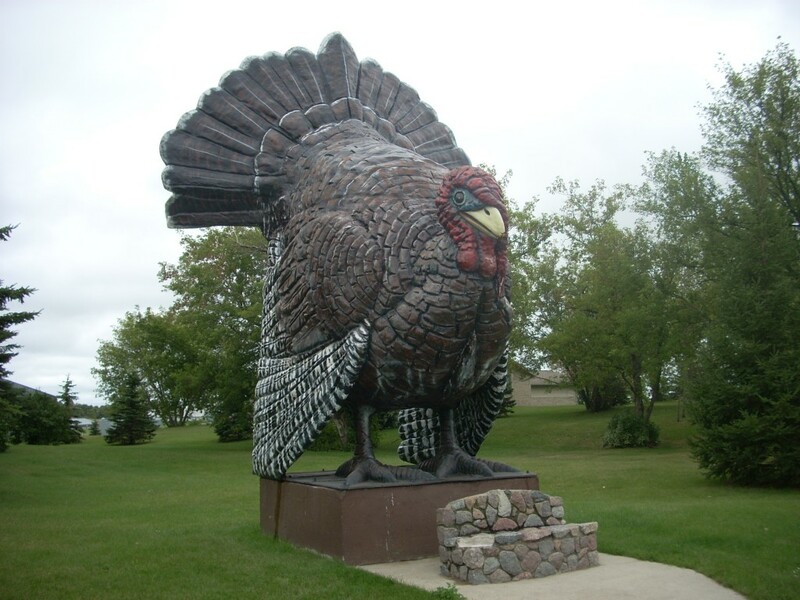 Although this is not the original (that one burned down in 1998), Big Tom, as he is known, is an awesome Minnesota roadside attraction, bringing people off the highway and past all the turkey barns that give Frazee its turkey distinction. Big Tom, as he is known, stands sentinel on a hill overlooking Town Lake as you come in from Highway 10. If you visit in summer, you very well may catch a whiff of the overpowering scent of the nearby turkey barns. Most find it pretty rank, but for some of us, it smells like home. Make sure to head into town and see Little Tom Turkey as well, standing at the corner of the main intersection of town. If you’re here in late July, check out the town festival, “Turkey Days,” and eat some of the best turkey you’ll ever have. The town meat market, Ketter’s, also sells the local favorite turkey jerky. 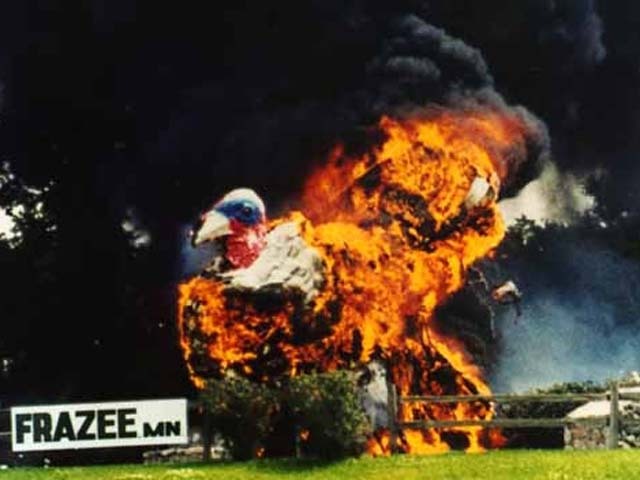 This is the classic shot of the Turkey burning down in 1998. Three local guys who shall remain nameless were working on some maintenance, as the story goes, with a cutting torch that accidentally ignited the fiberglass bird. The hollow inside acted as a sort of chimney and the damn thing was toast. A new one was ordered from F.A.S.T. and installed later that year. While in the area: Also in town is a huge scrap metal moose, and the Lion’s Park up by Big Tom has a pretty cool dam site. Also the train bridge over a car bridge over a river is another draw. Check it out! You might even see me hanging around town. This entry was posted in Highway Highlights and tagged Bird, Frazee, MN, World's Largest by Seth5544. Bookmark the permalink.